Enjoy this classic lawn dart game with a twist - they light up! Everything lights up very bright! We have illuminated the darts as well as the target rings using LED lights! The target rings use a very bright fiber optic material creating an awesome glowing target! 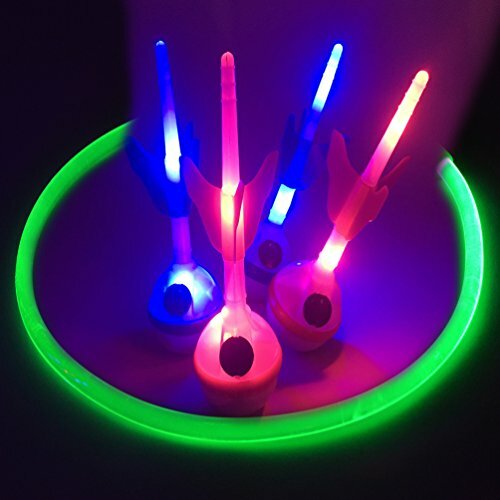 The glow darts have weighted, rounded bases on them so they usually stand straight up when they land. Lights are built inside of the Darts that illuminate the stem very bright. These glowing lawn darts are the perfect lawn toss game for your next BBQ, graduation party or event! We think you will be very happy with the quality and brightness of the game. LIGHT UP LAWN DART GAME, Perfect for Backyard fun! You'll be amazed how bright this game is! MUCH BRIGHTER THAN GLOW IN THE DARK - "Glow in the Dark" games rarely work good. You really need LED lights to brightly illuminate the game & do it right! PLAY WITH 2 - 4 PLAYERS - Enjoy playings heads up or with teams of 2! Toss the Darts into the rings to score points!